incredibly fed blog: Street Food! A few days ago a client asked us to cater for a corporate event his company was hosting. We had already catered a private party for his birthday in April and were delighted to be asked back so soon to cook again. This time it was to be an evening of corporate entertainment, the main event being a performance by the "Pop Up Opera Company" but also included was a book signing by the author Garry Hunter of copies of his study of recent street art from around the world. Our client asked us to come up with an original theme for corporate entertainment. After some thought the suggestion was a world street food fair to compliment the book's "World Street Art" subject. 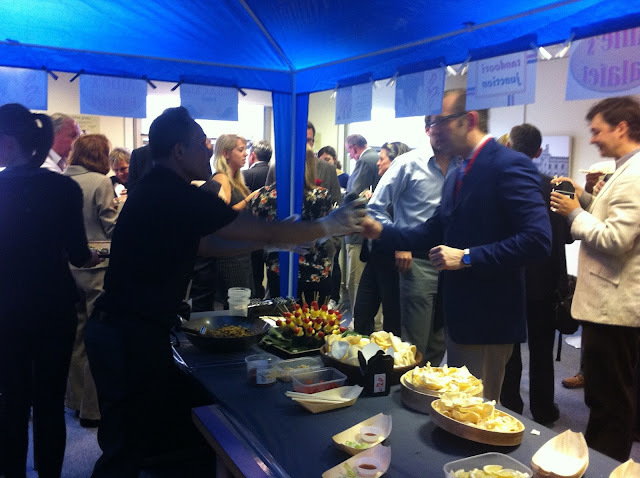 We suggested the food should be served from a street stall, an idea which the client loved and provided a menu of street food from around the world which we thought would be appropriate. The list included amongst other dishes fish and chips, burgers and hot dogs from Great Britain, stuffed vine leaves from Greece, various kebabs from the middle east, bhajis and peckoras from India and noodle and rice dishes from the Far East. In the end the client plumbed for Great British fish and chips, summer rolls from Vietnam, Falalels with hummus and tabouleh from the Lebanon, tandoori chicken from India and Asian rice noodle boxes all accessorised with heaps of prawn crackers, poppadums and a variety of delectable sauces and dressings! Desserts were retro fruit skewers with salted dark chocolate sauce and poached pears with ginger and mascarpone. All hands on deck during the interval! On that night we erected a garden gazabo indoors which made the perfect street "stall". Very much relieved that the tent structure actually fit into the room we set up shop underneath. Serving food had to be done pre- and post- the opera perfermance as well as during the interval. Luckily with the A Team of Ghaz, Emma and Maria manning the fort all the guests were "Incredibly Fed" in double quick time!